J. Michael Straczynski starts his long-awaited run on The Brave and the Bold this month. The comics blogosphere’s reaction to this assignment was basically, “Wait, DC signs one of the biggest names in comics and assigns him to a book whose sales were in a slump the last time big name creators were on it, and has been slogging along through limbo ever since?” B&B was thoroughly Mark Waid’s book, and honestly it should have been cancelled when he left it (although some of the interim stories have been decent). But why put Straczynski on it? Did he request it, to be able to have his own sandbox to play in? Who knows? The story itself is merely okay. 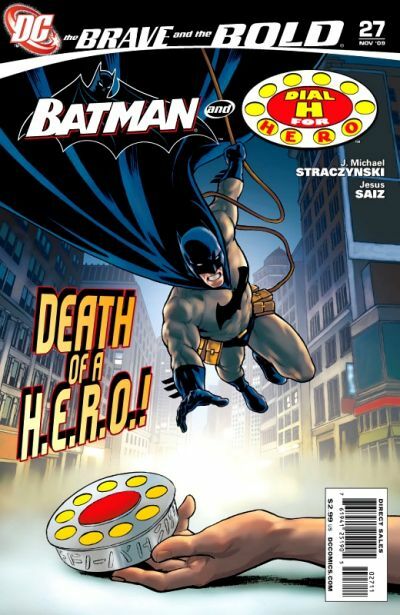 It features Batman and the extremely obscure character from the original Dial H For Hero, and it’s a thin story with a rather simplistic moral about doing something with one’s life. 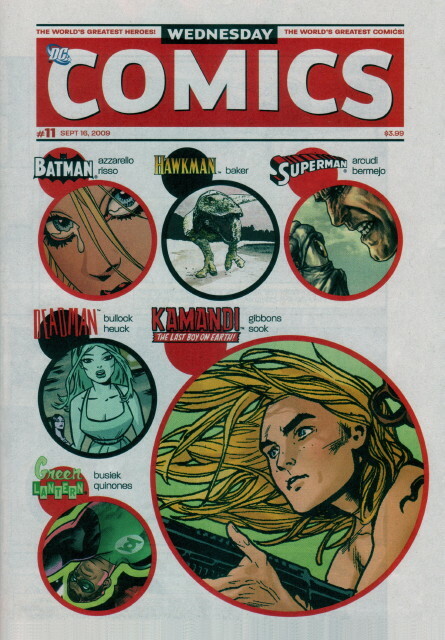 I’ve written several times before about my criticisms of Straczynski’s comics work, as much as I loved Babylon 5, and this issue is towards the lower end of his comics work. If all he’s going to do in B&B is write a few unconnected stories, then I don’t think it’s going to be worth it. Meanwhile, we’ll see how well he keeps up with the schedule, inasmuch as Thor was consistently shipping late and The Twelve – perhaps his best comics work – seems to be on hiatus. And, more importantly, whether he has a plan for what to do with a series with such a scatterbrained premise. It’s a little hard to believe that Wednesday Comics is coming to an end after one more issue, given that some of the stories feel like they’re not even close to being done after this issue. Superman, even though it’s been a terrible story, feels like it’s about to turn into the second half of the story after the cliffhanger here. Supergirl has been much better, but with her facing down aliens as her super-pets arrive on the scene seems like it’s setting up for several more pages, too. And then there’s Hawkman, which has a climactic moment this page, but then Kyle Baker’s over-the-top writing in this story has featured a climactic moment every other page. But I don’t see how Baker’s going to pull together Hawkman, Aquaman, an alien invasion, and DInosaur Island together into a satisfying finish in one more page. Of course, the writing’s been on the wall for weeks that Hawkman would be a terrible story. In other episodes, Strange Adventures has a neat touch in dealing with its villain this issue. And although I haven’t read Wonder Woman in weeks, this week’s page finally makes good use of the large-page format with a nice 2/3-page spread. Too bad I’ve long since stopped caring. Next week we’ll see how things finish up, and I’ll revisit all of the stories in their totalities. Among the most fun comics I can recall reading were Bob Layton’s two Hercules mini-series from back in the 80s. Hercules, the Greek demigod of myth, had returned to Earth and adventured with The Avengers for quite a few years; although a good guy, he also had a tendency to get drunk and pick fights, and – being a god – was able to shrug off the consequences of his actions much of the time, sometimes leaving a trail of carnage and/or sadness behind him. 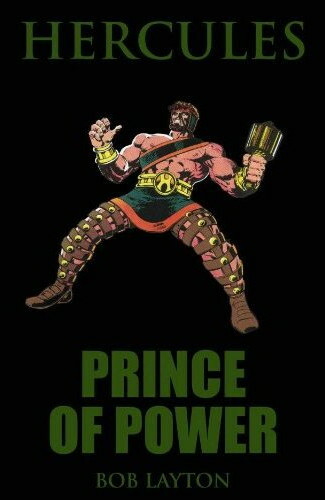 In short, having Hercules on Earth didn’t seem quite fair to everyone else. Layton tackled this challenge in novel fashion: Hundreds of years in the future, Hercules angers his father Zeus – again – and Zeus exiles him, but this time he exiles him to outer space, where there are plenty of beings who are Hercules’ equal, or more. This helps Hercules gain perspective on his place in the universe, but Layton also uses it for a series of absolutely hilarious adventures. Accompanied by a Recorder, a robot charged with observing everything he does, Hercules wades through a series of entertaining adventures, before finding himself suddenly aging, and learning that things have recently gone quite poorly for the gods of Olympus, forcing him to return home before he dies of old age to find out what’s going on. Although at times a moving drama, Layton never relinquishes his light touch on the material, and Hercules generally comes across as a nicer guy – and a more mature one – than the one currently appearing in The Incredible Hercules (although that series is not bad). And now that Marvel’s collected this in a handsome hardcover volume, I highly recommend checking it out. It’s a good time. Unthinkable was one of three series from Boom! Studios that piqued my interest this year, but I didn’t enjoy it nearly as much as either Irredeemable or The Unknown. 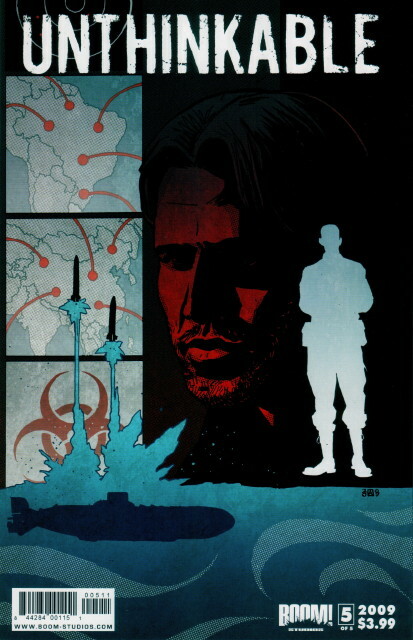 The premise was that author Alan Ripley joined a government think tank after September 11 to try to come up with other unlikely scenarios that terrorists might use to attack America or other countries. Which sounds fine until the think tank is disbanded and some of their scenarios come to pass. It’s a nifty high concept, but a tough one to pull off, since it plays its premise largely straight, which means having to thread a needle to make it seem plausible in the face of, well, doing the impossible. Writer Mark Sable gives it a good try, but I don’t think he pulls it off; the ultimate story behind the unthinkable events feels a little too simplistic, really in much the same way the climax to Watchmen didn’t quite hold up. I guess when you’re being compared to Watchmen – even flaws in Watchmen – you’re doing something right, but still the story didn’t really work for me. A worthy try, though. Artist Julian Totino Tedesco isn’t really my kind of artist; his sketchy linework over highly realistic layouts remind me of Jackson Guice, but darker. I think he could have used an inker with a strong sense of line coherence, a Tom Palmer sort, to pull the pencils together. But that’s just me. I’m not sure what to make of John Byrne’s Star Trek series for IDW. Assignment: Earth followed the adventures of Gary Seven and Roberta Franklin in the early 1970s, and then Crew followed the career of Number One prior to becoming Captain Pike’s first officer on the Enterprise. 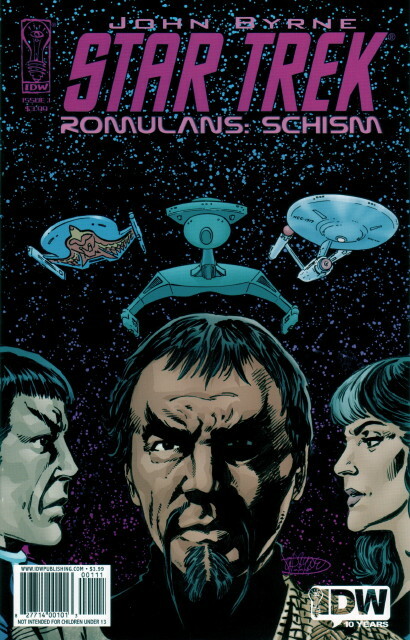 Now Romulans: Schism appears to involve the shaky Klingon/Romulan alliance circa the end of the classic Star Trek TV series (or maybe a couple of years after that, although not much later since Star Trek: The Motion Picture takes place at most 5 years after the end of the series, and the designs here are mostly classic Trek). Number One appears to be back, a little grayer, and the Commodore commanding a Constitution-class ship. What’s confusing to me is that Byrne usually has a method to his madness, a larger story that the smaller ones fit into, but it’s awfully hard to see how these three series fit together. Assignment: Earth was a set of mildly entertaining short stories, but the characters and plots weren’t really all that exciting. Crew was considerably more entertaining, but seemed to end just as it was about to get really good. Now we’ve jumped forward to focus on the two main villainous races in classic Trek. So where’s it all going? Or is Byrne just content to tell a few independent short stories, and enjoy playing in the Trek universe on his terms? Maybe it’s not going anywhere. On the bright side, Byrne captures the visuals of classic Trek perfectly; the thing looks beautiful. And Crew was a very well-told set of stories, while Romulans: Schism is off to a good, if rather ominous, start, with a solid cliffhanger at the end of this first issue. Despite being perplexed by Byrne’s ultimate goal – if there is one – this is some of the best Trek material I’ve read in decades, and that makes it worth the price on its own. 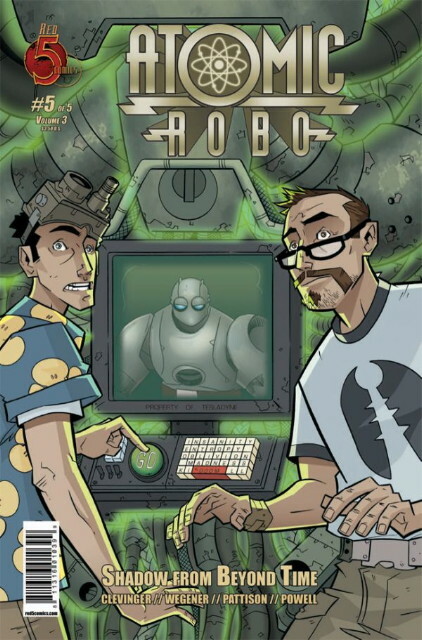 I’ve been conflicted about Atomic Robo since it began. I appreciate the premise – Nikola Tesla creates a sentient robot who lives into the present day and fights big monsters – and also Brian Clevinger’s wacky sense of humor in setting up the situations and writing the dialogue. Of course, the parallels between Robo and Hellboy are obvious; Robo’s personality is a little more extroverted, but they’re both strong monster-fighters with flippant tongues. The problem is that while Mike Mignola’s stories for Hellboy can be a little erratic, each individual story holds together pretty well, and when the story trails off at the end, it’s usually evident that that’s what Mignola was going for. The first Robo mini-series was a collection of vaguely-linked short stories, and the second one purported to be a single story but scattered to the four winds at the end. All that said, Shadow From Beyond Time is a solid step forward for Robo. It starts with Robo, Charles Fort, and H.P. Lovecraft in the 1920s fighting a Lovecraftian creature. The problem is that this creature comes from outside time, so Robo fights it over and over in the following years until it all comes to an end in this issue when he figures out a way to deal with it, and even loops back to the beginning to bring some closure to the first chapter of the story. It’s easily the best-told story in the series so far, and it makes me optimistic that things will keep getting better. Which is good, because as amusing as Robo can be as a character, it’s difficult to get invested in a series which is largely told in retrospect, and whose setting (Robo’s team and organization at Tesladyne) is left, at best, fuzzy. Madcap adventure can only take you so far.